Mrs Wood of 57 Seventh Avenue is listed in the local press as having donated lettuce and flowers between 21 August and 26 August 1916 to Northern General Hospital where casualties of WWI were being treated. 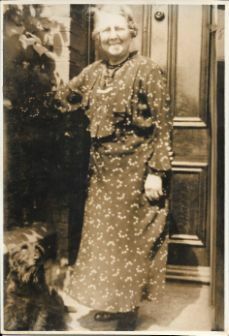 Apart from the same desire as many of the general public to contribute to the war effort, she had the additional motivation of having two of her three sons already serving in the Royal Field Artillery with the youngest to follow a little later. Isabella was born Isabella Walker on 19 May 1861 in Ayton, Berwickshire to Robert and Isabella Walker (nee Gourlay). The 1881 Scottish Census shows her still living in Ayton with her mother Isabella, now widowed, and her brothers John, Robert, James and Thomas. Her occupation is recorded as ‘farm servant’ so she is likely to have been familiar with growing vegetables which may be relevant to her later gifts to the wounded soldiers. By the 1891 Census she was married to David Simpson Wood, 29, a railway porter, who was also born in Ayton, Berwickshire on 13 June 1861, the son of John and Helen Wood (nee Simpson). 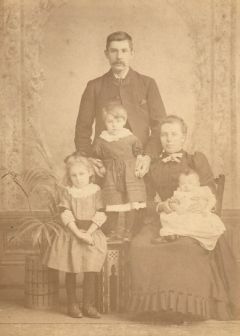 They were now living at Bishopwearmouth, Sunderland with their 2 daughters, Isabella Gourlay Wood, age three, and Helen Simpson Wood, age eight months, and Isabella’s brother Robert Walker, age 35, a corporation carter. Ten years later the 1901 Census shows the family living at 33 Elvet Street, Heaton (parish of St. Michael) with four more children: John David, age eight, Robert Thomas, age six, Margaret Cleghorn, age four, and Stanley Alexander, age one. David is now a railway guard and Robert Walker is still living with them and is now a general labourer. In 1911 all the children are still at home and the family is now living at 57 Seventh Avenue. David is now a railway passenger guard and Robert Walker a builders labourer. Of the children, Isabella at 23 is a confectionery shop assistant; Helen, 21, is a clerkess in a laundry; John, 19, is an electric wireman and Robert, 17, is a butcher with the Co-operative Society. Margaret, 14, is ‘at home’ and Stanley, 11, is at school. When the First World War started in 1914, life must have changed suddenly for the Wood family. John, Robert and subsequently Stanley joined up and served in the Royal Field Artillery. 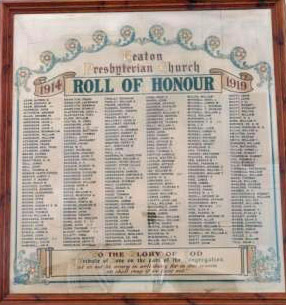 No military record has been found for John, but all three brothers are recorded on the Roll of Honour 1914-18 in Heaton Presbyterian Church (now United Reform Church). Robert served as a driver with 1st/3rd Northumbrian Brigade, Royal Field Artillery, Service No. 750395, as later did Stanley, Service No. 262357. Stanley was awarded the British War Medal and Victory Medal and it is likely that John would also have received these as a surviving serviceman. Robert served in France from 18 April 1915, where he was wounded, brought back to England and died from his wounds in St. George’s Hospital, London on 20 April 1917. He was buried in Byker and Heaton Cemetery (Grave reference xviii.v.3). 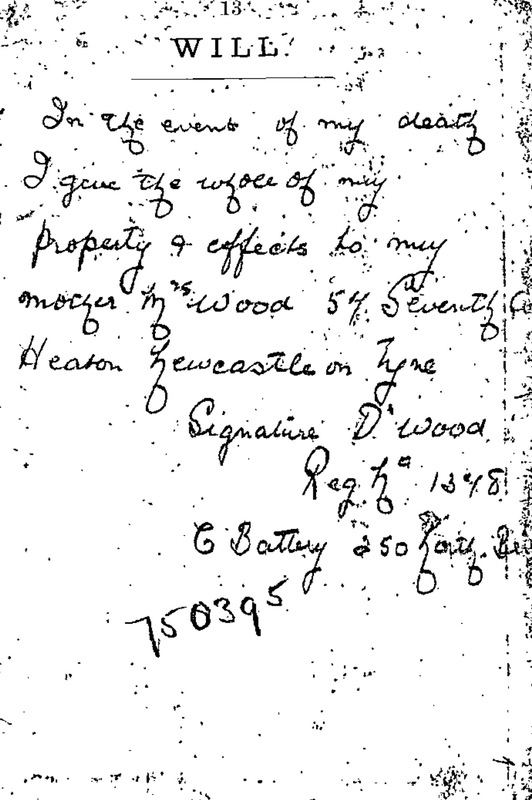 Like many servicemen, he carried a handwritten informal will which left ‘the whole of my property and effects to my mother Mrs Wood, 57 Seventh Avenue, Heaton, Newcastle upon Tyne’. This was enacted by the War Office and Isabella received the sum of £8 12s together with his War Gratuity of £11 10s. 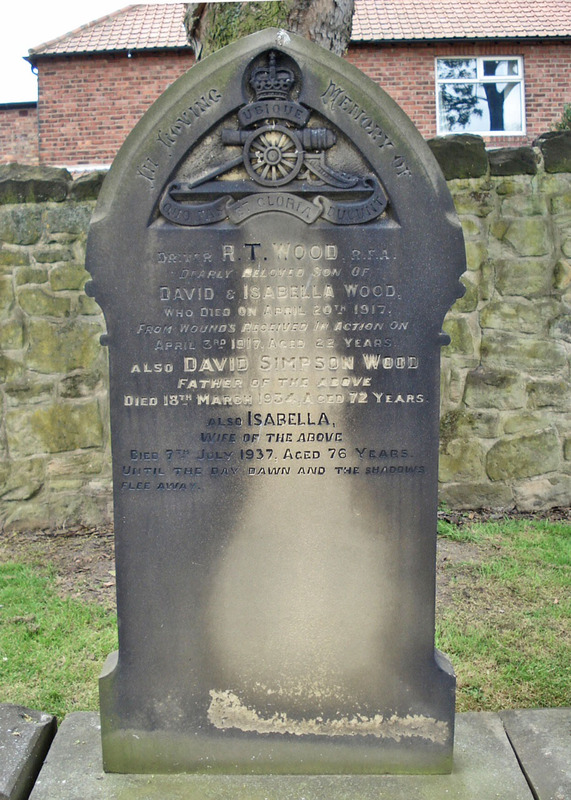 David Simpson Wood died on 18 March 1934 aged 72 and was buried in the same grave as Robert, as was Isabella when she died on 7 July 1937, aged 76. Isabella Wood’s gifts to the Northern General Hospital suggest that she may have been able to grow her own flowers and vegetables. 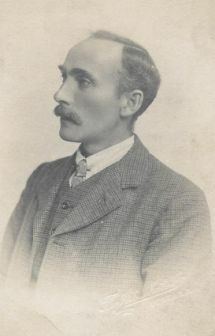 It is possible that there was some vacant land near the Avenues which residents were able to cultivate or perhaps David Wood’s connection to the Railways gave his family access to railway land. It is also possible that the family had an allotment somewhere nearby. As food supplies became more restricted with an increase in U-boat attacks on supply ships, the Cultivation of Lands Order of 1916 required councils to provide more land for cultivation for food production, and the minutes of Newcastle City Council show that ’55 separate groups of allotments have been formed and about 200 acres of land in the city put into cultivation, representing 2,900 allotments.’ Seed potatoes and manure were acquired and distributed at cost price to allotment holders, who could spread the cost over two or even three years. The Town Clerk reported that representatives of the AAA had made a complaint to him that rabbits from Armstrong Park entered upon the allotments and ate up the cabbage plants and other vegetables. They had endeavoured to prevent the nuisance but were unable to do so and appealed to the corporation to assist them. Growing your own was now essential and it seems likely that Isabella’s farming experience as a young woman in Berwickshire may have proved extremely useful to her and her large family. Since this article was written, we’ve been lucky enough to meet Olive Renwick, Isabella and David’s grand-daughter – Olive’s mother was Isabella, the Woods’ eldest daughter. Olive was able to tell us more about her grandparents, mother and aunts and uncles. She gave us permission to publish the photographs below. 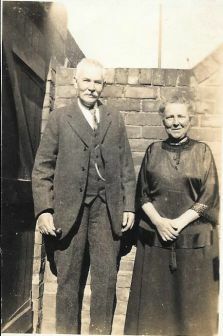 She confirmed that her grandparents had an allotment on railway land near Heaton Station but also that her Great Uncle Robert cultivated a field near Red Hall Drive. She remembers him carrying heavy bags of potatoes and stopping off at her house for a rest en route home to Seventh Avenue. She also recalled that her father, who worked on the railways, used to buy leeks from Dobbies in Edinburgh and sold them on to work colleagues and neighbours. 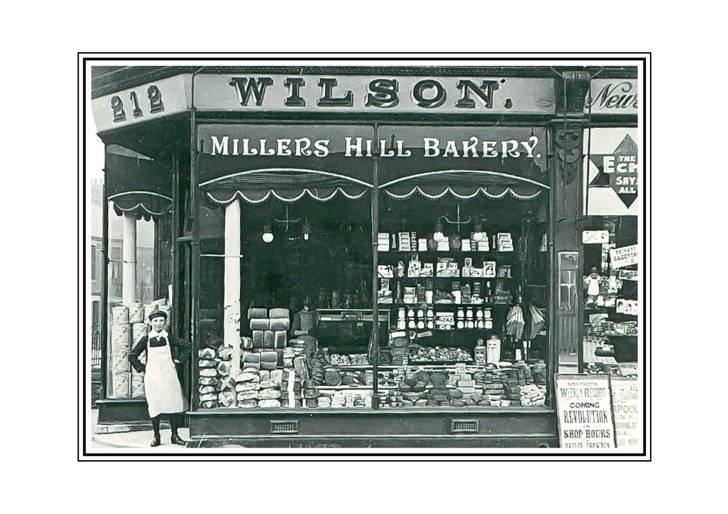 She was also able to add to what we knew from the 1911 census where it is recorded that Olive’s mother, the younger Isabella was a ‘confectionary shop assistant’. Olive said the shop was on Chillingham Road between Simonside and Warton Terraces ‘opposite Martha and Mary’s’. 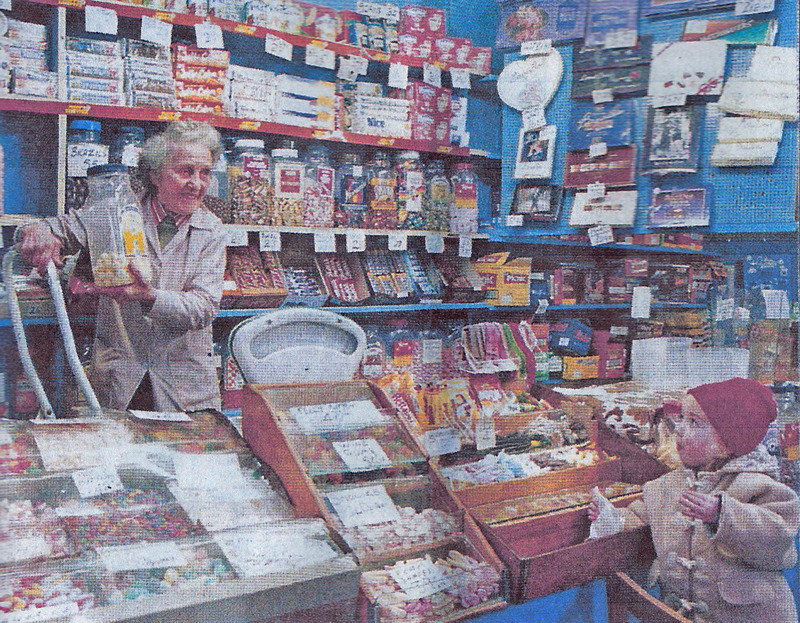 Her father used to call in and buy something every day on his way home from work, leading his mother to wonder why he’d suddenly acquired such a sweet tooth. Only later did she realised that the shop assistant was the attraction rather than the cakes! Finally, Olive’s daughter Margaret took this photograph of the war memorial in Heaton Presbyterian Church on which her great uncles are remembered. Heaton Presbyterian Church War Memorial where the contributions of Robert, John and Stanley Wood are commemorated. 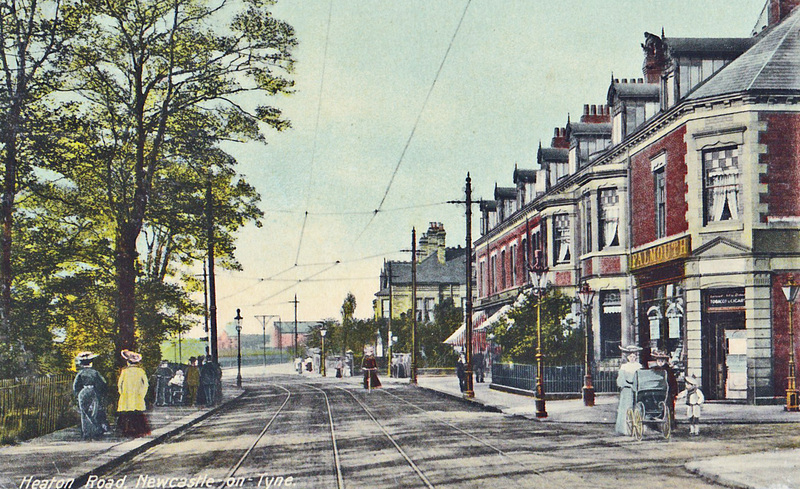 This article was researched and written by Caroline Stringer for Heaton History Group’s ‘Heaton Avenues in Wartime’ projected, which has been funded by Heritage Lottery Fund. An exhibition, ‘Feeding the Avenues’, will be on display at the Chillingham pub from late July until late September 2015. Many thanks to Olive Renwick, Margaret Coulson and Julia Bjornerud for all their help and for permission to publish photographs from the family archives. This entry was posted in Group Activites, Research and tagged Armstrong Allotments, Armstrong Park, Avenues, butcher, Byker and Heaton Cemetery, Chillingham Road, Co-op, Confectioner, Elvet Street, Isabella Wood, Olive Renwick, plaque, Red Hall Drive, Robert Thomas Wood, Seventh Avenue, Warton Terrace, WW1 on July 8, 2015 by oldheaton.